Put an end to the annoying paper war. 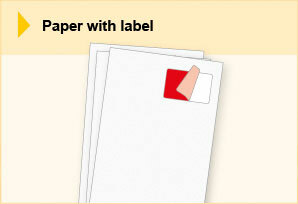 We offer you the option to order our smart paper forms with integrated labels. In addition to the standard blank photocopies, we also offer you both versions which can be customized individually, - e.g. colored with your logo and/or with other label sizes and positions. Just send us your inquiry or call us at: +49 (421) 56 905 0. For inquiries, help, suggestions, critic or anything else, please do not hesitate to get a hold of us at one of the following contact options.